The full release of PES 2018 is just days away now. We’re going to go through each of the top 10 players by the main attributes. These will include passing, shooting, physicality, defence, speed and dribbling. We will also discuss how accurate we believe these ratings are. 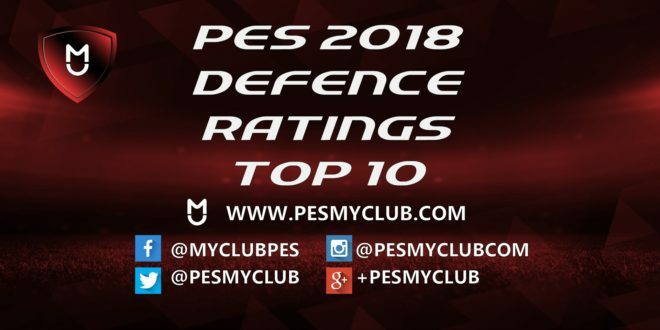 In this article we look at the top 10 PES 2018 defence players. Here are the current top 10 rated players for defence in PES 2018. These can be subject to change throughout the season. Are the PES 2018 Defence Ratings Correct? All in all the PES 2018 defence ratings look reasonable. It is interesting Andrea Barzagli has two higher than the second highest but this is likely the result of attributes combining to give his defence rating of 96. Another interesting entry in the top 10 is Chelsea midfielder N’Golo Kante. The most interesting point about this is he is the only midfielder ranked in the top 20 for defence. The next highest is Arturo Vidal with a defence rating of 88. We don’t disagree with Kante’s rating however as his tenaciousness and uncanny ability to break up certainly warrants a high defence rating. Considered by many to be the best defender in world football, some might be surprised Sergio Ramos only has a defence rating of 88. He is ranked as the second best defender overall of the game though (behind Leonardo Bonucci) likely due to his ability of scoring goals in big games.